ITHACA, NY (WSKG) – On Friday, the operators of the Cayuga Power Plant announced their plans to convert one burner of the coal-fired plant to compressed natural gas. 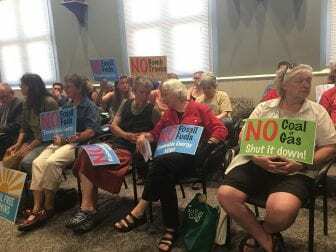 Anticipating the announcement, protesters attended a Tompkins County Legislature meeting earlier in the week. The plant is located in Lansing on the shore of Cayuga Lake. Mike Sigler supports the conversion. He represents the 6th District in the Tompkins County Legislature, which includes most of Lansing. The company says the gas will be transported by trucks, not pipelines. That has some residents worried. Irene Weiser is with Fossil Free Tompkins. She was one of the people protesting at the meeting. Not everyone agrees the trucks are dangerous. Sigler, the county legislator, said the trucks are tested and inspected by federal and state agencies. The company has had a contentious relationship with the community in the past. In 2016, the Public Service Commission rejected their application to have a similar conversion paid for by ratepayers. The state Department of Environmental Conservation has the final say on the conversion. A public comment period is required before that decision can be made.